I consider forex trading as a war. That is why, I named my trading systems by the name of weapons.However, today I am going to write about a trading system which is specially for scalpers. Scalpers are the traders who trades frequently. They are the brave traders who wants to capture every move of the market. 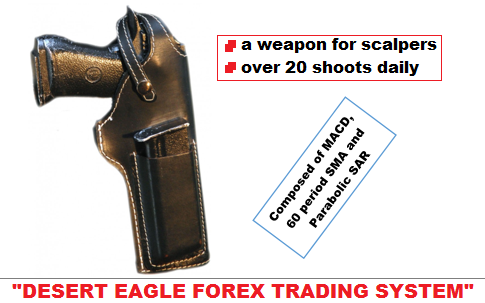 "Desert Eagle" forex trading system composed of three technical indicators which are 60 period SMA, MACD histograms and Parabolic SAR. The system is to be applied on the smallest time frame available. The treading strategy with this trading system is very easy. How to place a long order with Desert Eagle? (1) First of all, look for the market price to cross the 60 period simple moving average from below. (2) Wait for the MACD histograms to turn into positive territory. 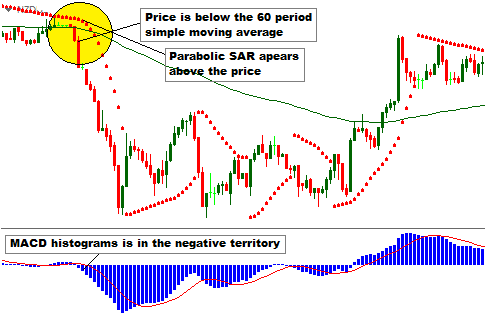 (3) Wait for the parabolic SAR to appear below the market price. This is the entry signal. (4) Place the stop loss 10 pips below the entry price. (5) Place the profit target 10 pips above the entry price. How to place a short order with Desert Eagle? (1) First of all, look for the market price to cross the 60 period simple moving average from above. (2) Wait for the MACD histograms to turn into negative territory. 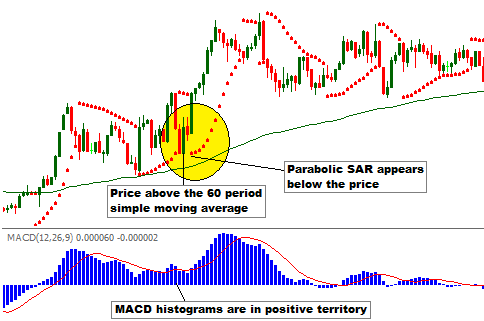 (3) Wait for the parabolic SAR to appear above the market price. This is the entry signal. (4) Place the stop loss 10 pips above the entry price. (5) Place the profit target 10 pips below the entry price. Dear traders, these are the trading strategy and setup with "Desert Eagle" trading system. This trading system is recommended only for the scalpers.If you believe you are a scalper, you can apply this trading system on your trading platform.